Computerized adaptive testing (CAT) is being introduced to the DiSC assessments. While your employees or clients might not even notice, this responsive testing technique means greater accuracy and an even more personalized profile. This form of testing responds to the test taker and questions presented are adapted according to how previous questions were answered. You might have already experienced it in academic testing or even trivia games. For example, if your math skills are being tested you might correctly answer two questions about ratios and so move on to a few algebraic questions where you get many more questions because you’re able to answer only a few correctly. The test results are then used to help you discover where you need to study. In other words, respondents are presented with questions and their responses determine the next questions they’re given. 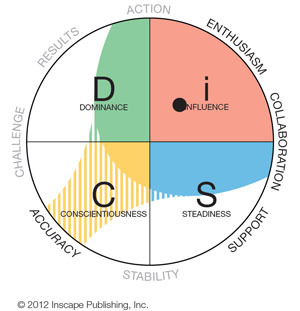 If you’re taking Everything DiSC Workplace and your answers are clearly showing a preference for steadiness, you might be asked fewer questions to confirm that preference. But if your answers regarding a preference for accuracy aren’t as consistent, you might be asked to answer more questions to discover nuances for that aspect of your personality. If you’re repeating this assessment, you might also notice that instead of responding to a list of adjectives you’ll be presented with phrases. On average, only 24% of respondents have received extra items to answer on an individual scale. Why the switch to adaptive testing? Adaptive testing allows for more precision in reporting. Precision. Since the test asks more targeted questions, it is more accurate. Confidence. A respondent’s answers will endorse consistency scale by scale. Personalized feedback. With greater precision comes more specific feedback. and a 32 percent increase in accuracy over DiSC Classic.